In 2000, Orleans began sampling freshwater ponds as a result of heightened concerns about pond water quality due to population growth. The impetus was a Cape-wide concern raised by the Cape Cod Commission and other community partners which led to the creation of the Ponds and Stewards (PALS) program. Each year, PALS offers an annual "Snapshot" whereby water samples collected by towns are analyzed free of charge by the SMAST Coastal Systems Analytical Facility Laboratory. Orleans has been an active PALS participant. 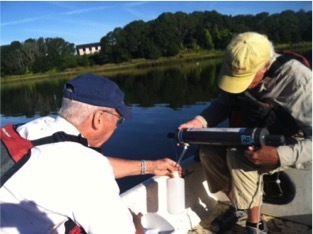 Each year Orleans volunteers have collected data from many of the town’s ponds at least twice using the PALS sampling protocol as guidance. One of the samplings is a PALS Snapshot of water collected from mid-August through September. 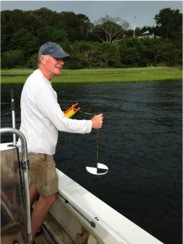 PALS sampling procedures include water column measurements of dissolved oxygen and temperature and Secchi disk transparency - a general measure of ecosystem condition. Laboratory analysis of the samples includes total nitrogen, total phosphorous, chlorophyll a, pH, and alkalinity. Ponds currently being tested include Bakers Pond, Boland Pond, Cedar Pond, Chigger Pond, Critchetts Pond, Crystal Lake, Deep Pond, Gould Pond, Ice House Pond, Kettle Pond, Little Quanset Pond, Marine Pond, Meadow Bog Pond, Pilgrim Lake, Reuben’s Pond, Sarah’s Pond, Shoal Pond, Twinings Pond, Uncle Harvey’s Pond, Uncle Israel’s Pond, Uncle Seth’s Pond, Wash Pond. A report on the condition of the major freshwater ponds of Orleans is available at the Town of Orleans website.